Brittish Canoe Union, BCU is an international recognized certification system for professionals and athlets . The system has a 1-5 star grading system, where 5 star is the highest level. The first levels focus on your kayaking skills as a member of the group in protected waters where the higher levels fokus on your skills as a leader in rough sea. This course is for all of you with good kayaking experience that would like to develop you kayaking and leadership skills. The course is a preperation for a separate assesment course. 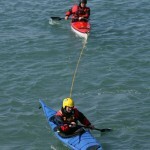 The idea is to coach and develop your skills so that you become more comfortable as a kayak instructor or leader. After completing the cource you will have 3 years to complete the assesment and receive your certification. 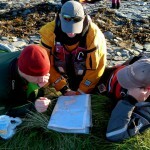 The focus is to develop you paddling skills, safety and rescue, navigation and leadership. 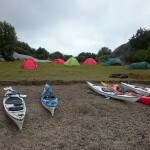 The aim of the cource is that you will be comfortable to lead a group of paddlers, on short (6 to 8 miles, of at least 3 hours paddling), single or multi-day journeys in a moderate tidal water environment with winds not exceeding Beaufort Force 4. This is a perfect cource if you work or intent to work as an kayak instructor or guide. 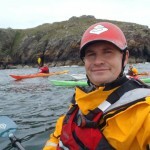 Mark Tozer has been messing around in all kinds of boats in all kinds of waters as an active paddler and coach for the past 25 years, with sea kayaking being his specialism. 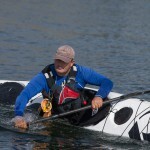 Mark has gained a number of British Canoe Union awards including the coveted Level 5 Coach (Sea). He is a coach trainer and assessor as well as a BCU Star Award examiner. Mark has participated in and lead a number of overseas expeditions to such places as Alaska, Baja, Norway, Greenland, Morocco, Tanzania, Kenya and Ecuador as well as completing a doctorate (PhD) in expedition leadership. Presented below is a summary of the threedays cource please read the Syllabus, Training notes and Assement notes for further information. 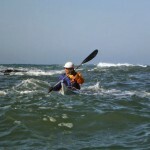 You have previous kayaking experience both from flat water and more rough sea. It is also a benfit if you have previous guide or instructor experience that you would like to develop. Bring your own kayak or rent a fully equiped kayak from us. Bring tent and camping equipment if you would like to camp on one of the islands close to the center. We treat you for lunch and coffe during the theoretical first day of the course. Welcome to join us, book now!